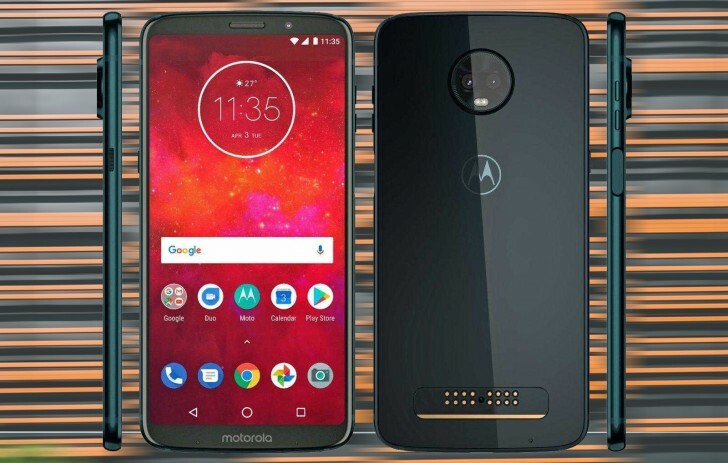 The Motorola Moto Z3 Play is now much less of a mystery thanks to an internal document, obtained by XDA developers. The leaked paper reveals the phone's key specs as well as all of its key selling features. The Moto Z3 Play will have an aluminum body with a 2.5D curved Gorilla Glass at the front. There will be a 6-inch 18:9 "Max Vision" FullHD+ AMOLED under that. The Moto Z3 Play will have a Snapdragon 636 chipset with 4GB of RAM at its heart. There will be either 32GB or 64GB of built-in memory, which will be expandable through microSD cards. There will be three cameras on the Moto Z3 Play - a dual camera with a main 12MP snapper and an 8MP selfie camera. The camera will offer portrait mode on the front and back cameras and will be able to capture cinemagraphs, creative effects, spot color (where you leave just one color in the photo), cutout mode (where you'll be able to replace the background behind the subject) and scan text mode. If you were expecting a huge built-in battery, you're in for a bit of a disappointment. The capacity is 3,000mAh, which is about average for the size, but the good news is there's a Moto Mod in the works that will expand the battery life further. In fact, the Moto Z3 Play will be offered in four bundles - Power, Style, Gamepad and Projection. The last two will bundle a Gamepad and Projector Mod. The Power bundle has a Battery Moto Mod while the Style a style shell. Yet the mods are over priced, so the device should be priced correctly. I know Nokia 7+ doesn't have option to add Mods but do you know how many Z series users are using mods on their device.